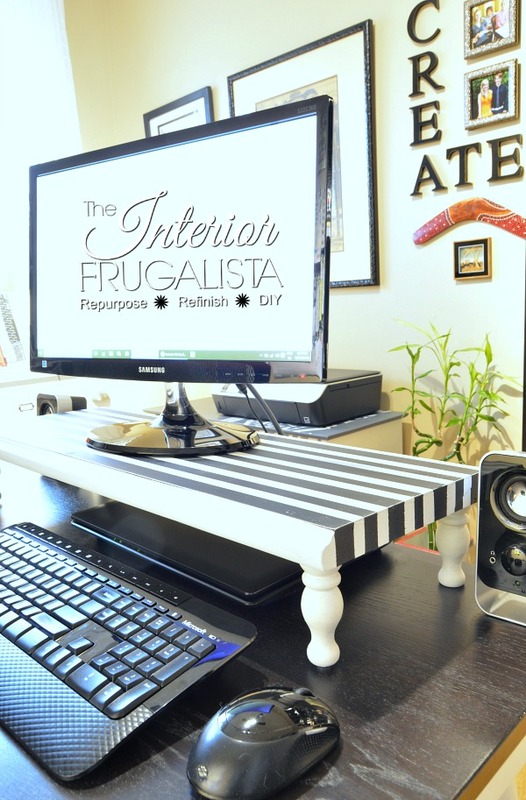 I am so excited about today's post for a couple of reasons, one because my desk finally has a more functional workspace and it's Power Tool Challenge day. 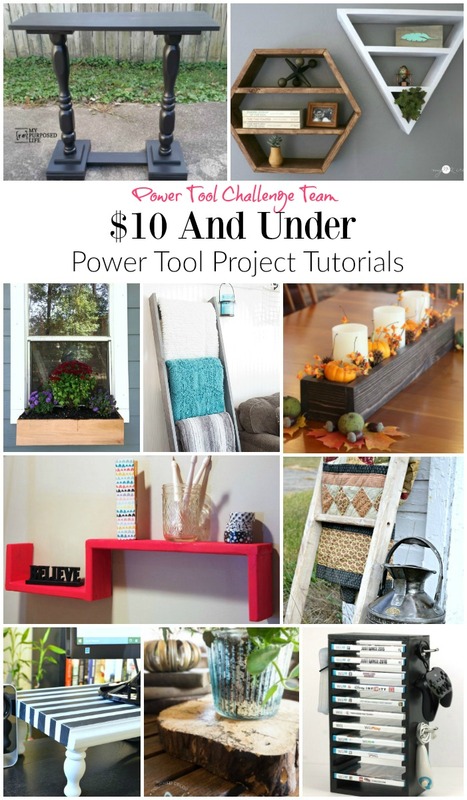 The theme this month is to create something for $10 or less using at least one power tool. 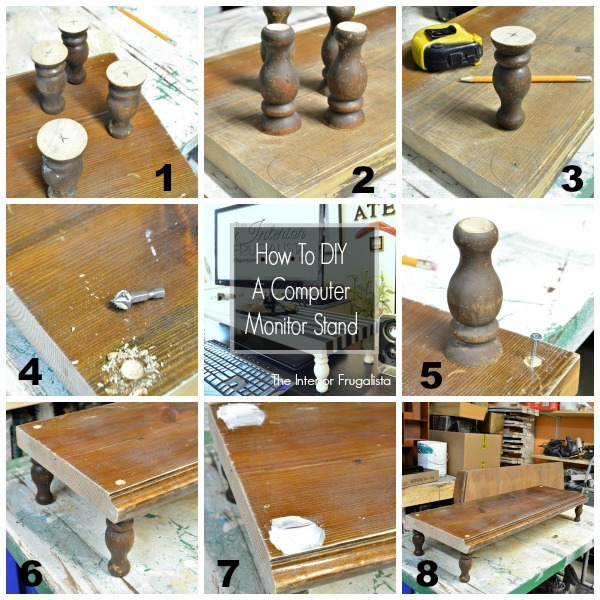 I made my handy DIY Computer Monitor Stand for FREE by repurposing part of an old footboard and two antique chair spindles. Fortunately, my salvaged footboard was leftover from a headboard bench and was a perfect size, so no cutting required. 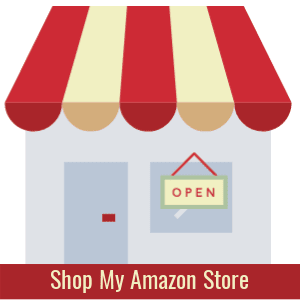 The dimensions are 11" x 30" x 1 1/2". Check your local home improvement store in their offcut lumber section to see if you can find a piece that would work. They can cut it to size for you if using a table saw is not your forte. 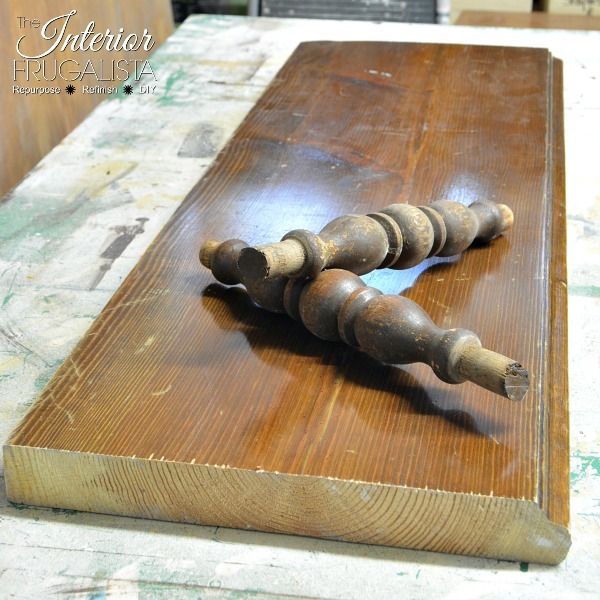 Using a miter saw, the antique chair spindles were cut in half and then again at a height of 3 3/4-inches tall. Find the center of the top of each spindle and mark with a pencil. 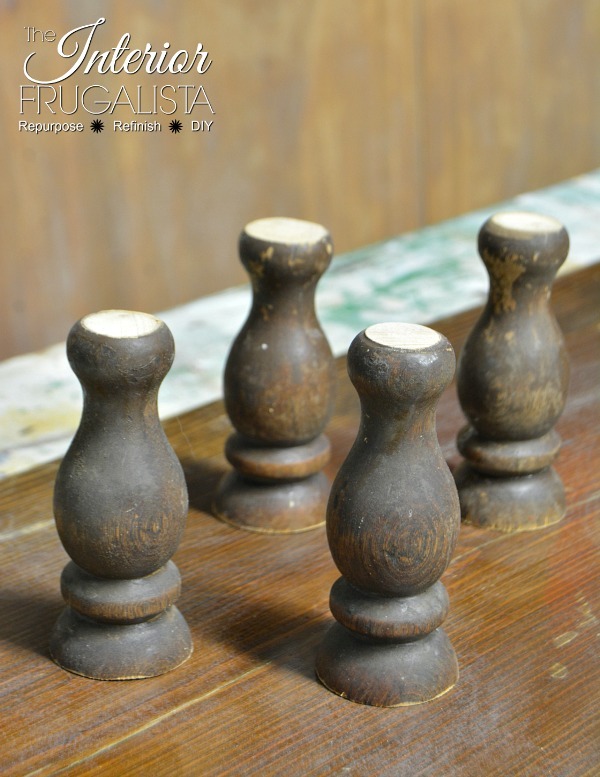 On the top side of the footboard place a spindle on each corner and trace with a pencil. Find the center of the traced circle and mark with a pencil. Using a power drill with a 5/64 pilot hole drill bit, make a pilot hole on both the spindle and stand top. Switch the drill bit to a countersink bit. You want the head of the screw to be sunk below the surface of the top. Using wood screws start the screw through the top until it is peeking through underneath. Line up the pilot hole on the spindle and secure it in place with the drill. Repeat for all four feet. Fill in the holes with a non-shrinking wood filler. That's it, the monitor stand is assembled. The next step is adding the pretty! Using a mouse sander (or sander of your choice) to smooth the finish on the top and sides of the top. 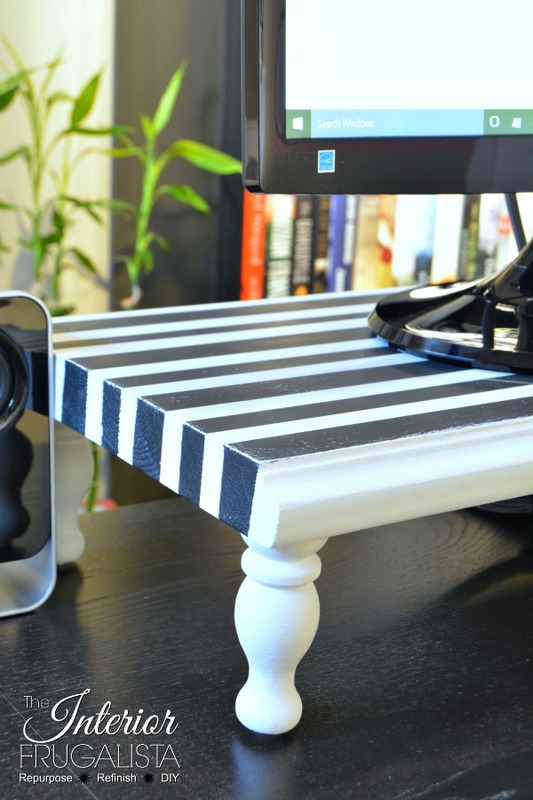 I painted two coats of white chalk paint on the entire monitor stand. 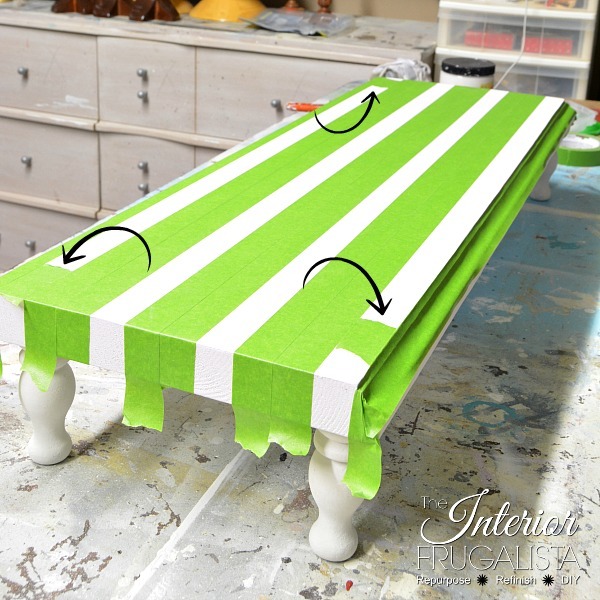 Using painter's tape create a stripe pattern. Tip: Use pieces of tape in between each row to get straight lines (as seen in photo above). 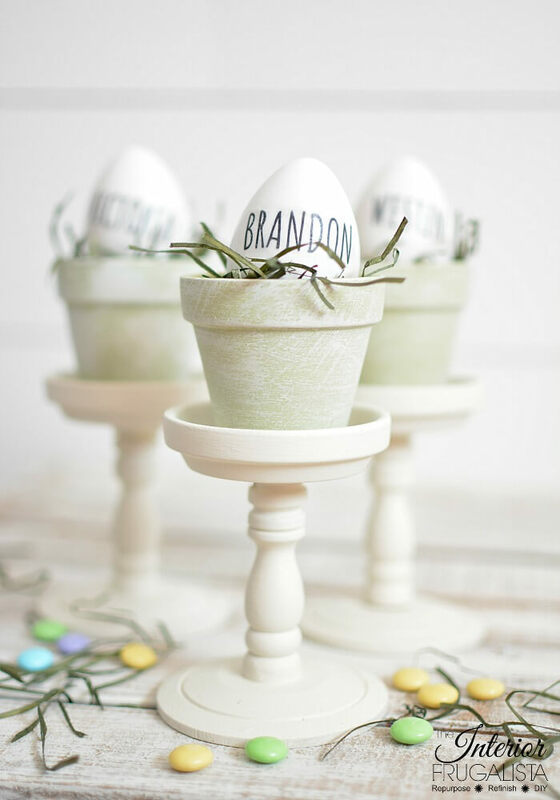 Run your finger along the edges of the tape for a tight seal to avoid paint bleed. 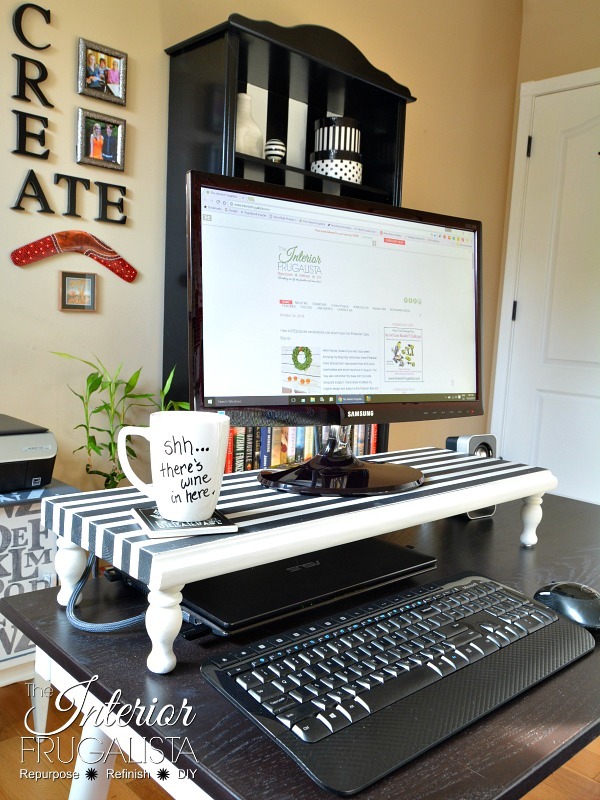 Using a 6-inch sponge roller apply two coats of black chalk paint. Before the second coat dries, remove the painter's tape. Tip: Slowly remove the tape by pulling at a 45-degree angle while the paint is still wet. I distressed the stripes by sanding them with 220-grit sandpaper. I applied clear wax using a clean lint-free rag for added protection. 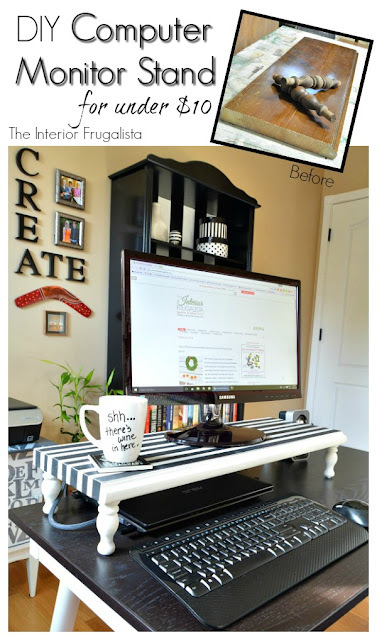 I am so thrilled to have my monitor and laptop screens at eye level with room to tuck the keyboard underneath when not in use. In dire need of additional functional space on my desk, working in my office is so much easier now. It's been a long time coming but thanks to the Power Tool Challenge this month, I finally had the motivation to build my DIY Computer Monitor Stand. If you like my Computer Monitor Stand and/or want to build one, please save it on Pinterest and/or share it with a friend. 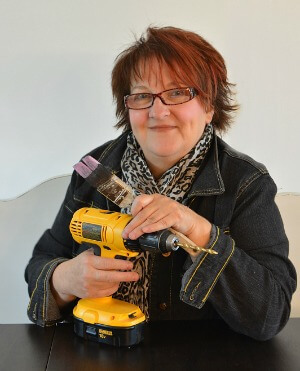 I say it each month, the purpose of the Power Tool Challenge is to motivate, inspire, and encourage our female readers to build something using a power tool. So I urge you to pick up a power tool and make something.